At the tail end of 2014 we were approached by Groove Korea who had an interest in what we are up to. Now this could be a step in the right direction. Fresh makgeolli currently only has a shelf life of around 30 days due to the fermentation process. Any longer than that and it starts to taste quite sour and bitter….but not in a good way. According to the Korea Food Research Institute, this could all change as they have found a way to extend the storage life of makgeolli to 100 days. This could be mean big things for the export market, as previously it hasn’t been worthwhile to ship and stock overseas buyers with the short lifespan. Makgeolli has long been the drink for farmers who work long hours in the fields and are in need of a refreshing pick-me-up. Still today, nothing satisfies better than a cool, crisp bowl at the top of a mountain hike. Now there’s a new makgeolli on the shelves that is geared towards the image of makgeolli as a replenishing sports drink. Called ‘Me 3%’, this new makgeolli comes in two flavors, regular (Me3 Blue) and citrus (Me3 Green), and it has a lower alcohol content to most kinds of makgeolli. It comes in shiny cans and is marketed towards those playing golf or football or other outdoor sports. ‘Rice Wine’ or ‘Rice Beer’? The debate wages on. When describing makgeolli for the first time to people who have never tried it before, it can be a real challenge to really get it across. The words we usually use are milky, sour, sweet, thick, carbonated….which to someone who has never tried makgeoli before might think it’s like expired drinking yoghurt. We are working on that! But the question on many makgeolli lovers lips these days, is do we call it ‘Rice Wine’ or ‘Rice Beer’ in English? Rice wine conjours up images of sake or soju, some sort of clear potent liquor. Whereas Rice Beer seems to be something so foreign, that the words just don’t seem to go together. The argument for rice beer is makgeolli’s low percentage of alcohol, brewing process, and the way it is consumed these days. But is that really what makgeolli is definitionally speaking? In about February last year, news broke about Slow City Brewery’s intention to open America’s first makgeolli brewery. Since then, it has been all quiet on the western front and we haven’t heard much since. However the Illinois Liquor Control Commission posted the brewing company’s application which is on mandatory viewing for 45 days. That means things are stepping up and we could see makgeolli finally being produced on US soil! That’s right, makgeolli has its very own day, and we couldn’t be happier! Every year, the last Thursday of October is designated to celebrate our favorite drink. 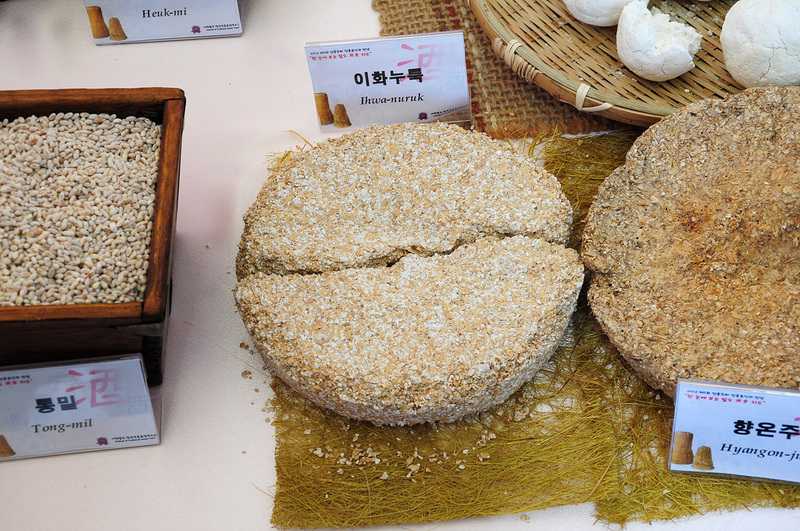 This is the day that Haepssal makgeolli is brewed with newly harvested rice. So what are we doing to celebrate? Do you really need to ask?!! We will most definitely be raising a bowl to the drink that gives us such happiness all year round, but that’s not all. The Korea Traditional Liquor Festival will be held from today (October 25th) to Sunday October 28th. There will be tastings from breweries all over the country, concerts, and the chance to make many different kinds of traditional liquor related products.